Whenever I wear one of LeeZu Baxter’s creations, I feel like I am in some sort of fantastic dream. With their explosion of texture and colors and shapes, LeeZu’s creations push beyond standard fashion in SL and challenge the status quo of slapping textures on mesh templates. LeeZu just released a gown of epic proportions—mesh with a variety of patterns and textures—and when I say “texture,” I mean texture. You can feel the gold in the stripes, you can sense the pull of the tentacles through the air from the headpiece and hear the tulle shifting around under the voluminous skirts as you walk. What better dream than the one in pure sensual technicolor? Maizon Rayna’s pretty Christmas tree drops down my back and hangs from my ears. The beautiful gold jewelry is better late than never in this blog. And once again I revisit Rocketta Haven’s newest skin, a delicate dreamlike beauty with full lips and a painterly visage. I can’t help but float in this dream within a dream. I’m a bit grumpy. The holidays are over but there is crap still strewn all over my living room. My property tax bill came in and has to be paid. It hasn’t freakin’ stopped snowing for a month. And the Christmas cookies have added up on the scale. So I am back to a healthy eating regimen (bleah), I have the check written and sent to the village, and I am letting someone else do the shoveling. At least in SL I can look put together. I start with this darling dress form Zii Minotaur, who makes mesh mostly for furries, but the dress fits us less hirsute creatures as well. She cleverly included many sizes with the dress so that many shapes can fit it and attaches the top and bottom separately so a variance of size in top to bottom can also fit. The texture and silhouette are darling, especially with the bow in back. And my silly and fun Grumpy Cat stole is a hunt gift at her store right now. I didn’t put my grumpy photo in the lead composite because I wanted to show Sawsan Secretspy’s very gorgeous new skin on a “nice” face. I love the luscious lips, the beautifully shaped brows, the pretty nose and deep skin tone. She includes appliers for Slink and Lolas. Circe Ishtari recently released a set of eyes with the larger irises typically favored by Japanese creators, and the colors are luscious—I love the depth of this brown. My sassy style is one of Truth Hawk’s newest with his great color hud. 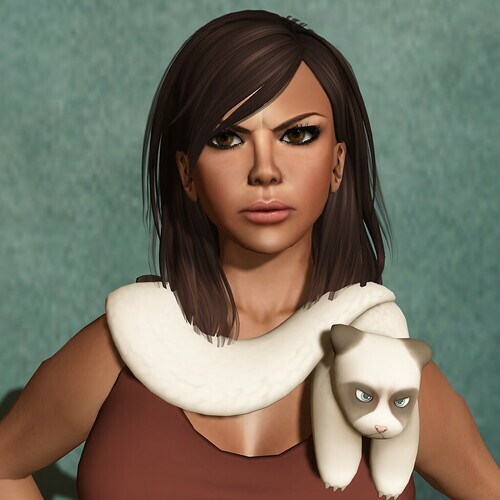 Well come to think of it, I can look cute and stylish in SL—what’s there to be grumpy about? Skin: . ::WoW Skins::. Maram Med 01 by sawsan Secretspy for .::WoWSkins::. Hand applier: . ::WoW Skins::. * Maram Medium slink applier hands by sawsan Secretspy for .::WoWSkins::. Feet applier: . ::WoW Skins::. * Maram Medium slink applier feet by sawsan Secretspy for .::WoWSkins::. Make sure you see the Grumpy Cat meme. It will take the grumps away in no time! To add glamour to the task, I have put on a new dress from Kim Lysette, one she is offering for a mere 49L right now if you get over and grab it. With a beautiful exotic texture down each side and a long straight mesh skirt, this dress is elegant and chic. 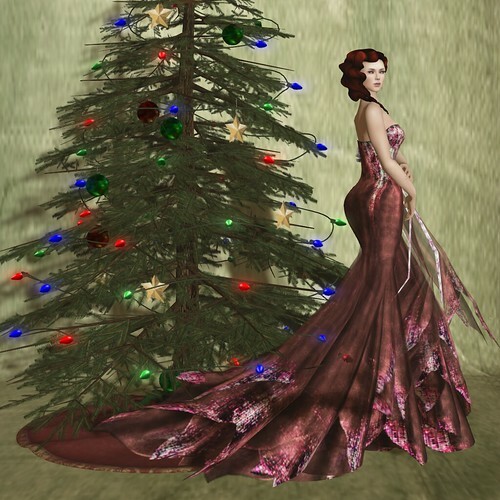 Add Maxi Gossamer’s jewelry for Fameshed and the look is tall and thin and hides the Christmas cookie weight I gained. My long wavy hair is one of Truth Hawk’s newer ‘dos, a side swept look with his characteristic beautiful textures. My skin is one of Shyla Diggs and Tricky Boucher’s newest with a pale lip and beautifully lined eyes. And Funeral Plutonian is offering these lovely eyes at the RMK Gothic Fair for a fresh alternative. Monica Outlander recently put on a fashion show of epic proportions with some of her newest Black Label fashions on display. I was not able to go but I understand it was quite something and I am not surprised, because when Monica thinks, she thinks grandly and with sweeping creativity and beauty. She invited many people to participate in The Golden Thread, her show, and asked people to make artistic photos using her Black Label Fashions. I did one for the show but it’s not PG enough for the blog, so you can see it here. One of the most beautiful pieces from the show was this dress, Shae, which is an absolutely gorgeous mesh assemblage with materials features (see the sheen on the bottom). In this gown, Monica brings romanticism to the modern by using mesh to create folds of brocade and satin and sheer taffeta in a pile up of gorgeous materials. Each detail—from the bead-decorated bodice to the buttons running down the corset to the flowers adorning the hips is attended to with loving care. This is how haute couture is supposed to work—a celebration of the senses and shapes. Monica outdid herself and truly produced a work of art. The dress suits this new skin from Rocketta Haven. Yes, I showed it yesterday but I have to show it again today because I am absolutely smitten. The delicacy of this skin, the gentle features, the romance of the look deserves more than just a glance. Even the hands are lovely (featuring a nail applier from Sasy Scarborough perfect for the holidays). My side swept hair is MissAllSunday Lemon’s newest release, an almost wind-blown style that echoes the drama of Monica’s dress. One of my favorite fantasies about Christmas comes from long romantic novels I read like Cecilia by Fanny Burney (yes, I read the whole thing.. ack) or Sense and Sensibility by Jane Austen or even Downton Abbey. The ladies dress in their finest, attend a winter ball in which they are whisked into an exceedingly warm room of dancers and high intrigue and waltzed around the room by handsome gentlemen of means, all jockeying for their favor. And they do this through the “season” of parties and balls. Everyone speaks in charming, euphemistic language, fans are fluttered, and hearts are joined and broken. So when I see an old fashioned tree like this from Tobias Convair (and yes, I know it has electric lights on it from Tya Fallingbridge—don’t be pedantic about my fantasy here), I want to put on a ball gown and ready myself for the ball. In this case I wear Mami Jewell’s newest gown, which she made for Anjelica Carling, the 2014 Miss Virtual World. With a sparkling texture across the bodice and in the flexi prims, the dress is a picture of sparkling holiday beauty, especially paired with Maxi Gossamer’s sparkling jewelry from Fameshed. The beauty of this look comes from Rocketta Haven’s newest skin. With a unique beauty that is Rocketta’s own, espeically the full pouty lips that go beyond the usual beestung look ad the lined eyes, the skin harkens back to an old-fashioned beauty. Paired with Silverr Andel’s eyes and Mirja Mill’s latest hair, a vintage wavy ‘do, our heroine has a touch of tragedy and romance to her look. Today I can’t be tamed. Start with a top from LeeZu Baxter, a system top done in Leezu’s magnificent artistry with ruffles at the bottom, little buttons, clipped straps. The old fashioned system piece, when done well, is still a wonderful avatar look and Leezu is one of the few that has the skill to pull it off. I pair it with Ivey Deschanel’s gift from the KittyCats Advent Calendar—a set of wild mesh pants with animal skin on the cuff. She includes four pairs in the gift—this is one of them. It’s a perfect gift for wild cats. Aida Ewing recently released the Kaelyn skin, which I have enjoyed wearing in the India tone. Some of the makeups are bold and some are subtle. This one is in between. AvaGardner Kungler offers this chic necklace based on organic shapes and probably real life jewelry. I love how Ava experiments with her jewelry, shapes and colors. Finally, Mina Nakamura put out this great side swept tousled look. I love how it wraps around the neck with pieces going down in back and a lock escaping in the front. It’s so natural and wild. I am so PLEASED to congratulate Fabfree for winning the Avi Choice awards for best blog. I sincerely think there was no better blog for the title. (I am not being gracious here—I mean it.) I was good friends with Renee Lowenhart when she was running the blog, and I know how much work she put into building Fabfree. Love Trill and the other ladies have taken the baton and run with it, keeping up the fine standards Renee set and making it even better. They work DAMN hard on that blog, bringing people news of great items, keeping the free area at the Wash going, and running a ginormous group of freebie hunters. And they put slurls on EVERYTHING (and I know how much work that is). I know I refer new people to the blog at least three times a week. I am so pleased they got the award. That being said, I am also pleased that I ranked in the top 5. Of course it’s not scientific and of course it’s all about some crazy poll on a website but dang, let me gloat just a little here for being in the top 5. I was thrilled to be nominated, so of course for this I am so honored. Thank you for voting for me! And congratulations to the other blogs! That being said, I will now take you back in time to the Victorian era when Christmases were festooned with holly and velvet and delight galore! Actually, I’ll take you over to Genre, whose theme this month is “Victorian Christmas,” and a ton of creators are participating. I am actually amazed at some of the work because I can tell it’s original mesh, not templates, and it’s been done with the event in mind. Take for example the skirt I wear from Kaliope Karas in plaid with a green hem, which I separated from a whole outfit she is offering so I could show Kerryth Tarantal’s gorgeous jacket with her distinctive complex textures. Kerryth has grown by leaps and bounds, looking at this, having drawn in all the fine detail—buttons, shadows, piping. She’s not just laying a fractal on a prim anymore. It’s gorgeous. And you can barely see but Tiffy Vella has made the most darling mesh shoes with a Victorian brocade print and a ruffled vamp. The accessories at the event are exquisite. 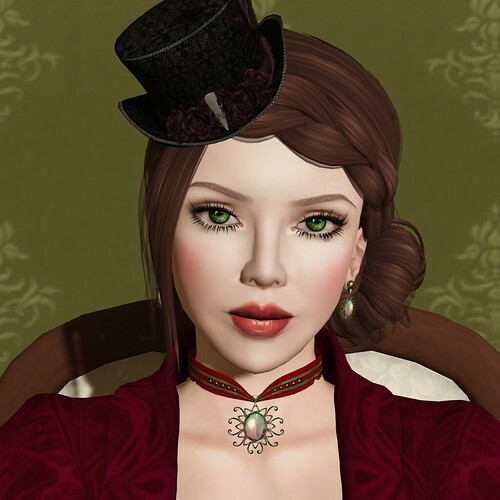 The gorgeous choker and earrings from Ellantha Larsson are simply a taste of what is being offered and Synjari Myriam’s top hat is one of many toppers up for sale. Chandra Masala offers this porcelain and pristine skin with a hark back to bygone days and I wore one of Helena Stringer’s makeup tattoos to get a deeper lip. 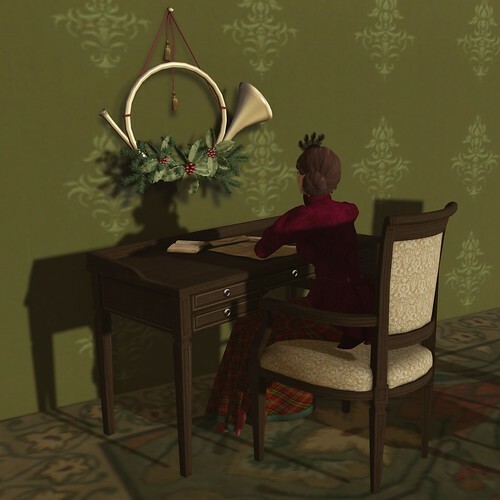 You will also find a variety of Victorian creations to furnish your house including this curio desk from Morgana Brid, which includes texture change features to change the wood and upholstery. And Lashae Karsin used her posing talent to make a stately Victorian chair that also has a few standing poses. Abathyr is generously offering the Christmas stocking I show with a texture change script to allow different names to be embroidered on the stocking for a mere 10L. In fact, almost every creator offers one 10L item so being Victorian this holiday won’t break the bank.